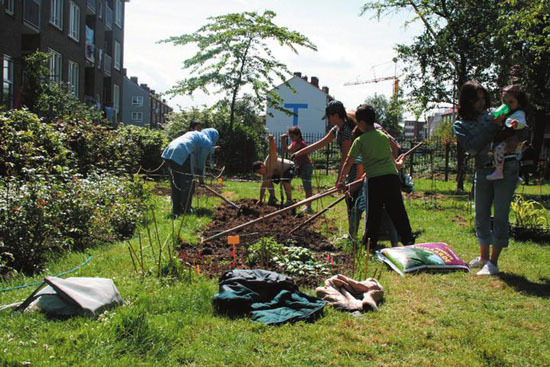 A vacant site situated at Lodewijk van Deysselstraat 61, in the Nieuw West district of Amsterdam, has been converted into a community kitchen with an adjoining garden on the back. 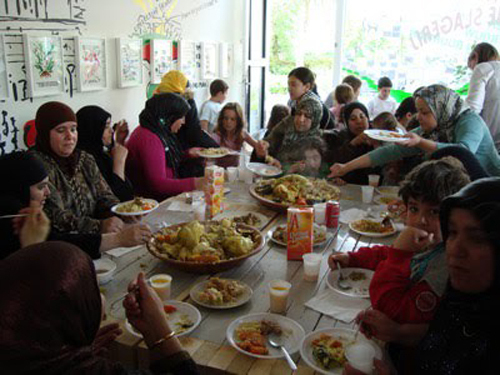 A community kitchen and a meeting place provides a centre around which the community can engage in the process of “building a place” – a much-needed ritual in a climate where families experience continual resettlement. Beyond the core group of residents, the community kitchen attracts other residents, too, who take part in the activities there. With its open-door policy, the community kitchen has also brought security to the street, another added value for the neighbourhood. The community vegetable garden is located behind the kitchen on land that used to be fenced off. Today, twenty-two families from seven ethnic groups take care of the garden. Marjetica Potrč and Wilde Westen (Lucia Babina, Reinder Bakker, Hester van Dijk, Sylvain Hartenberg, Merijn Oudenampsen, Eva Pfannes, Henriette Waal), Residensts of Nieuw West neighbourhood.